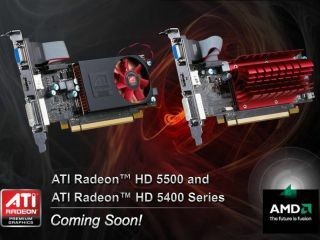 AMD has formally announced its ATI Radeon HD 5570 graphics card, bringing DirectX 11 support for small form-factor PCs. These particular PCs are becoming increasingly common as media servers, and AMD is hoping that its current monopoly in DX11 cards will make it the obvious option for graphics. "AMD recognises that small form-factor PCs are becoming more popular and low profile graphics upgrade options have been limited to date," said Matt Skynner, Vice President and General Manager, AMD Graphics Division. "Customers purchasing small form-factor PCs are looking for improved performance while gaming, watching HD video or working with the latest productivity applications. "The ATI Radeon HD 5570 graphics card delivers all of this at a price that won't break the bank." Those features include ATI Eyefinity for multiple displays, 1080P HD playback and ATI Stream technology support. AMD's ATI HD 5570 graphics card is available from Overclockers retailing for £72.99.